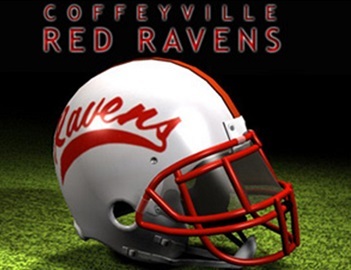 A rivalry game that dates back to 1925 took place last night in Independence as the Coffeyville Red Ravens faced the Independence Pirates in the Montgomery County Showdown. Both community colleges started flat footed offensively, wanting to the run the football but both D-lines came to play stopping most plays forcing more throws than wanted early in a game. Coffeyville was able to score in the first quarter on a great back shoulder throw and catch from Proctor to Thomas-Cobb for a 32-yard TD putting them up 7 through the first. Both secondaries for the defenses also stepped up in this game as from there on out, Carson Proctor went fairly silent finishing 11 of 24 for 101 yards, and C.C.C’s defense picked off Chase Hildreth of Independence 3 times and didn’t allow a TD through the air. Late in the second quarter, Coffeyville was able to get a run game started as Marco Lee finished a good drive for the Red Ravens with a 1-yard TD which was followed by a quick field goal by I.C.C just before the half putting the score at 14 to 3. With seemingly all the momentum coming out of the locker room, it was actually Independence was on the attack as their defense was able to recover a fumble to the end-zone cutting the lead to 5, then too the risk and came up short on the 2-point conversion putting the score 14-9. Shortly after it was Independence again in the third quarter storming down the field on a good drive that finished with an 11-yard run for the score and the lead 16 to 14. A scoring play was not the biggest play of this game, as later in the 3rd, a short field goal attempt by I.C.C was blocked by defensive back #1 Markquese Bell who finished with an INT, 4.5 tackles and a few huge plays down the stretch of the game as he also took home our Simple Simon’s player of the game. That blocked field goal was the spark the needed as early in the forth the Red Ravens where able to drive down the field with their run game and score with a Deshawn Massey TD to give them the lead. Many times, this season Coffeyville’s defense has stopped great drives as they where able to silence I.C.C for the remainder of the game giving the Red Ravens their 80th win in this storied rivalry and putting them at 3 and 5 on the year. Tough game next week as they host the 2016 national champs Garden City Bronc Busters at home, and covered on your home for Red Raven Football 98.1 KUSN kickoff at 7PM.